Here is your chance to experience Bizou like you never have experienced it before, while helping to feed the area’s hungry. It’s The Charlottesville 29 Restaurant Auctions, presented by McGuireWoods. 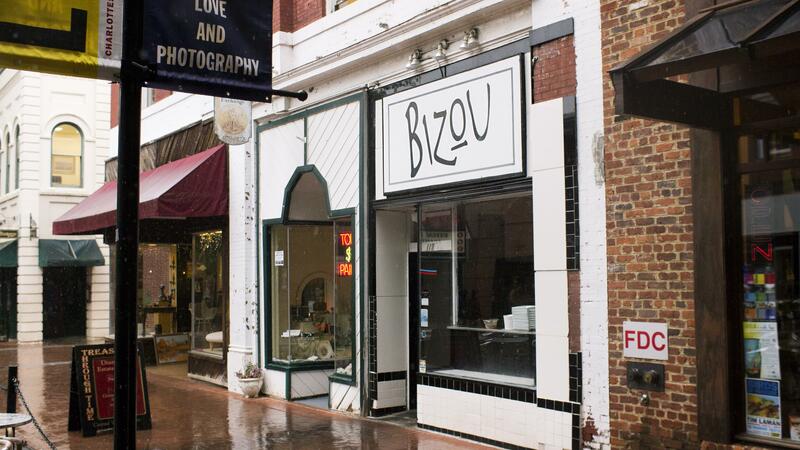 Along with all of the other restaurants in The Charlottesville 29, Bizou has created a signature experience available to whoever pledges the highest donation to The Blue Ridge Area Food Bank. Bizou is generously donating the food and drink, which means the winning bid goes directly to the food bank. Each dollar donated is enough to provide four meals to the area’s hungry. So, a winning bid of, say, $1,000 would mean not just a wonderful meal for the winner and their guests, but also 4,000 more meals for the area’s hungry. With Bizou co-owner Tim Burgess from West Virginia and his partner Vincent Derquenne from France, the food at Bizou has long drawn on American influences, with a steady French backbone. For the auction winner and nine guests, Bizou will return to Derquenne’s roots with a classic Parisian brunch. Bizou is known for one of the best and most popular brunches in town, with crowds every Sunday. But, the auction winner will have no crowds at all as their venue will be the patio of Bang!, which they will have all to themselves. Their meal will begin with a patisserie assortment, a specialty of Derquenne, with plenty of champagne to go with it. “It’s not a party without champagne,” says Derquenne, who is one of Charlottesville’s most knowledgeable oenophiles, and will select all of the champagne and sparkling wines for the meal. Next, they will enjoy a three course meal of Parisian brunch classics, with more sparkling wines, like cerdon, brachetto d’acqui, and more. The meal will finish, of course, with more champagne. “It will be fun,” says Derquenne. “We will try to show guests a range of great sparkling wines with their meal.” It’s a sparkling Parisian brunch for 10. Note: The winner will schedule the dinner on a mutually convenient Saturday or Sunday for Bizou. Bidding for the Bizou auction ended on July 19, 2016. Here is your chance to experience Ace Biscuit & Barbecue like you never have experienced it before, while helping to feed the area’s hungry. It’s The Charlottesville 29 Restaurant Auctions, presented by McGuireWoods. Along with all of the other restaurants in The Charlottesville 29, Ace Biscuit & Barbecue has created a signature experience available to whoever pledges the highest donation to The Blue Ridge Area Food Bank. Thanks to the generosity of Ace Biscuit & Barbecue, the winning bid goes directly to the food bank, and each dollar donated is enough to provide four meals to the area’s hungry. So, a winning bid of, say, $1,000 would mean not just a wonderful meal for the winner and their guests, but also 4,000 more meals for the area’s hungry. Since opening Ace Biscuit & Barbecue in 2012, Brian Ashworth has been cooking in his wheelhouse. For the auction winner and eleven guests, Ashworth will cook at his actual house – a dockside cookout by the pond of his 55 acre Barboursville farm. Ashworth loves to use his hibachi grill, and he will grill an array of chicken, pork, beef, and shrimp. Sides will be his personal favorite recipes like beans and rice, candied yams, and cornbread. To wash it all down, the auction winner will receive four cases of beer, courtesy of Champion Brewing Company. “Don’t wear high heels,” warns Ashworth of the rustic farm setting. “Grillin’ and chillin’,” he says. It’s the ultimate Dockside Country Cookout. Note: The acution winner will schedule the dinner on a mutually convenient Monday or Tuesday for Ashworth. To best appreciate the setting, Ashworth strongly recommends an October evening. Bidding for the Ace Biscuit & Barbecue auction ended on July 18, 2016.